This is a family fav. Its easy to whip up and contains ingredients we always have in! Its also delicious and nutritious. 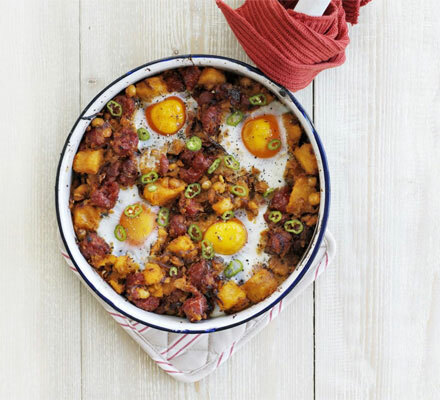 Its also really nice without the Chorizo, just add a little chilli pepper to the hash mix if you are not sharing it with the kiddies (or if the kiddies also like a bit of spice!). My almost 3 year old loves it. I got it from the BBC Good Food Mag, great for inspiration. 4 large eggs (preferably organic) or as many eggs as you have people so everyone can have an egg! Boil/steam the sweet potatoes (if boiled save the water for your stock pot or for when you make soup) until tender and drain. Use a fork to break down mixture and to flatten- not too chunky but also you don’t want it too sloppy. Heat the Grill, break the eggs onto the top, season with some salt and pepper (works really nice with Pink Himalayan Salt but Sea Salt works just as well!). Put under the grill until the whites are set. Sprinkle on the chilli and serve. Easy peasy!! Wow, I can’t imagine even eating this. I like sweet potato–but only baked and by itself. Are you using pork chorizo? We also don’t eat pork in our family. I am sure no one in my family would touch this if we made it. That’s the beauty of having a choice!